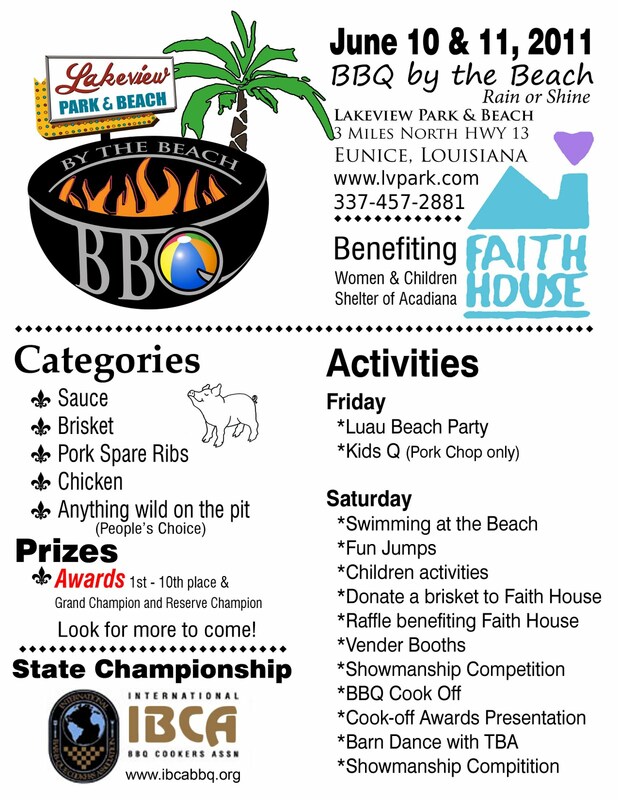 I'm thrilled to be judging the BBQ by the Beach in Eunice, Louisiana on June 10th and 11th! The State Championship IBCA contest will feature excellent grill masters from all over. If you want to cook or come eat with me, please let me know and I'll get you all set up. It will be a great couple days of Louisiana BBQ! If your group of buddies does not take an annual guys or girls trip, you’re really missing out on life. Sure, it is nice to take family vacations, travel with loved ones and significant others, and see the amazement in kids’ eyes when they first see some of the wonders of the world. But, it is also nice to just get away with your best friends, leave all your worries behind you, and enjoy other cultures for a little while. For me, enjoying other cultures means experiencing traditional food and drinks as well as customs, music, and general attitudes about life. On a recent guy’s trip, seven of us from Louisiana ascended to Homer, Alaska for a week where we were blessed with gorgeous weather and even lovelier people. We had no ideas about the ties between Alaska and Louisiana. Apparently everyone in Alaska is somehow from Louisiana, knows someone from Louisiana, does business in Louisiana, or at least appreciates Louisiana like few other people do. Maybe it has something to do with the uniqueness of our cultures that few people in the rest of the United States understand. It possibly has something do with the economy since two of the major sources of wealth for both states are energy (oil) and seafood. Whatever it is, I found it to be really interesting, and when I saw a museum exhibit about the Exxon Valdez oil spill from 1989 it really hit home. In many ways, Louisiana is just a warmer, flatter, humid-er version of Alaska… complete with delicious seafood, friendly people, a rich, unique culture, and an oil disaster of its own! Homer, Alaska is a rustic yet hip fishing village and tourist destination on the south end of the Kenai Peninsula, resting on the west side of Kachemak Bay. They boast themselves as the Halibut Capital of the World, and guided fishing trips bring in the majority of the tourists to the otherwise quaint town. Knowing that their busy season stretches from Memorial Day to Labor Day, our group decided we would plan our trip for the week before Memorial Day, thereby missing the heavy crowds and tourist-induced price inflation. On our first full day in Homer we booked a charter halibut fishing trip. I’ve been on charter fishing trips in the Gulf of Mexico before, but I had never before reeled up anything like a halibut. The largest fish we caught weighed about 65 pounds, but they can grow over 300 pounds! Our captain took us way out so that we could have a chance to catch a big one, and then brought us back into the bay so we could be assured a good catch. All in all we had a great trip and left the docks with over 100 pounds of fresh halibut filets! Jay, Brent, Matt, Eusebio, Gary, and Eric Returned from a Successful Halibut Fishing Trip! The following day we invited some Homer locals over for dinner and drinks with a little Louisiana flair. Among our guests were Karen and Steve, owners of the Homer Brewing Company, a small and passionate microbrewery that produces fantastic local beers that you can’t find anywhere else save the rare keg that makes it up to Anchorage. The Homer Brewing Company treated us well all week long, and I am very thankful to Karen and Steve for sharing their beers and hospitality with us! Their favorite brew seemed to be the Red Knot Scottish. This ale uses Scottish yeast and cask conditioning to create an amber ale that is mild yet extremely flavorful. After sharing a few brews, the time had come to turn our attention to the food for the evening. Chef Eusebio Gongora, who happened to be a member of our traveling party, prepared a beautiful halibut-four-ways meal for us that began with a fresh Alaskan halibut ceviche. The ceviche included morsels of halibut filets, roasted bell pepper, orange, red onion, jalapeno, garlic, lemon juice, lime juice, salt, and pepper. The dish had a tropical taste that I don’t think they get very often in Homer. The halibut easily highlighted the ceviche with its fresh and tender marinated flesh filling up the bowl of sweet, sour, and spicy deliciousness. Not to let the ceviche highlight the night by itself, Eusebio also served up a batch of crispy halibut fritters. They shared similarities with Southern hushpuppies, though I’ve never had a hushpuppy with seafood stuffed inside before! The fritter had a cornmeal base that was cut by a little bit of flour. Chef Gongora then added onion, celery, bell pepper, garlic, butter, smoked cheddar, salt, and pepper to go along with the fresh and beautiful diced halibut. After mixing all the ingredients together they were formed into balls and deep fried in vegetable oil until they turned crispy and light brown on the outside. The contrasting textures between the crunch on the crust and the warm, moist core made the fritters a pure delight to bite into. Finally we readied ourselves for the main course. Eusebio prepared some mashed potatoes and asparagus for side items, but what really got us all excited were the two additional variations of Halibut. The first method of cooking took the smaller pieces of halibut, dipped them in egg and milk, rolled them in Cajun fish fry, and then dropped them in a pot of hot vegetable oil. Much like fried catfish in the South, this variation of halibut left the fish tender, moist, and flaky while providing a nice crisp on the outside. Cajun Fried Halibut… In Alaska! The final round of halibut for our dinner was prepared a little more traditionally but still contained every bit as much taste and flavor. Chef Gongora used the larger halibut filets, seasoned them up real nice, and then pan seared them before finishing them off in the oven. Before serving, he topped each filet with a homemade lemon butter that offered a tangy taste to complement the fish. The pieces of halibut ate like ridiculously tender steaks. Each bite offered tremendous, fresh flavor that you could cut with a fork and would melt in your mouth. The Alaskan halibut dinner satisfied everyone from first bite to last. The growlers of beer from the Homer Brewing Company went extremely well with dinner, and nobody left hungry. After eating halibut the way we did I can understand why it can cost as much as $20 per pound to get it fresh in Louisiana. Good thing we brought about 70 pounds home with us! Hey Bite and Booze friends! This Friday there is a really cool event going on that I'm happy to be a part of! 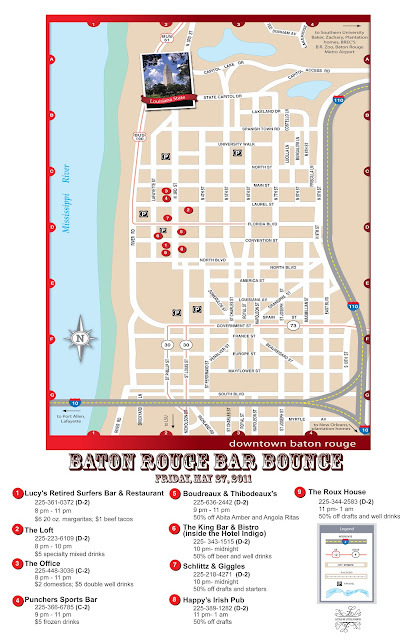 The Baton Rouge Bar Bounce is going on downtown and I'm being featured as the "celebrity bar bouncer!" 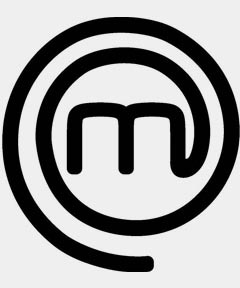 I know I know, I'm not really a celebrity yet, but at least a I have an appearance on national television coming up because of MasterChef! I'm going to start my evening at Jarvis Green's Charity Wine Gala, then make my way downtown. I sure hope to see you there. Let me know if you plan on coming and I'll make sure to find you! 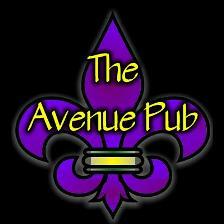 Immediately after Live After Five, on Friday, May 27, the Baton Rouge Bar Bounce begins. Nine downtown restaurants will offer discounted drafts, specialty drinks, margaritas – even tacos and nachos- to those who have the cowboy boot cup. The Baton Rouge Bar Bounce will be from 8 p.m. to 1 a.m., the Friday before Bayou Country Superfest. Cups are available for purchase online and at Live After Five. Some good home cooking from a laid back joint is just what you need sometimes. Nothing fancy. No white table clothes. No pretentious foodies barking about cooking sous vide or using molecular gastronomy (though I am a fan of those things). Nah. More like come on in darlin', sit in a booth, and eat some Texas-sized deliciousness out of a deep fryer! My buddy Chad and I recently ate at the Live Oak Grill in Sugar Land, TX. A lot of Sugar Land is overrun with massive suburbanization and the streets are lined with retail dining chains. I remember growing up there and thinking that a lunch at TGIFridays was a good meal. Oops. Fortunately if you know where to look, even the cookie-cutter Houston suburbs have some good finds. Live Oak Grill looks like it is in a house with a huge Texas flag painted on the roof. Okay, maybe that's not so cool. I mean, is that really necessary? Well, maybe. There's something interesting about Texas. No matter what, they make no mistake about boasting that they are, indeed, Texan. I feel a similar pride in Louisiana, but we haven't learned how to express it like they do in Texas. The lone star that is hangs from walls and car mirrors is special. It makes me vomit in my mouth sometimes, but it is special. Chad's wife Ashley works at Live Oak Grill. That's really why we were there. Well, that and because they wanted me to eat there. Naturally, since there was food involved, I obliged. I'm always willing take suggestions and dine at places that are new to me. While the beer selection didn't lean towards too much craft stuff, they did have some good regional and local brews out of Texas like Shiner and Saint Arnold. Can't argue with that. I started my meal with some huge, delicious onion rings. The massive Vidalias were cut thick, breaded, and fried... just like any good onion ring should be. And they were indeed very tasty. Soft, flavorful onion inside a crispy fried coating... yes! Then came the main course: a gigantic chicken fried steak absolutely smothered in white gravy with a side of macaroni and cheese. The steak came out with a crunchy exterior and full of flavor on the inside. It had been pounded out and properly tenderized, that's for sure. The gravy was a bit excessive, but also contained enough pepper to make it a delicious accompaniment to the juicy fried steak. The mac and cheese lacked a little inspiration, but the basic noodles and cheese sauce still hit the spot. For dessert, Ashley brought out a couple brownies with scoops of Blue Bell's homemade vanilla ice cream. I love a good chocolate-vanilla, hot-cold combination! Delicious! All in all, Live Oak Grill is definitely the kind of place I enjoy dining at when I travel. It is authentic, local down home cooking. It is the kind of place with character and a soul. I like that. And I like a good chicken fried steak every now and then too! 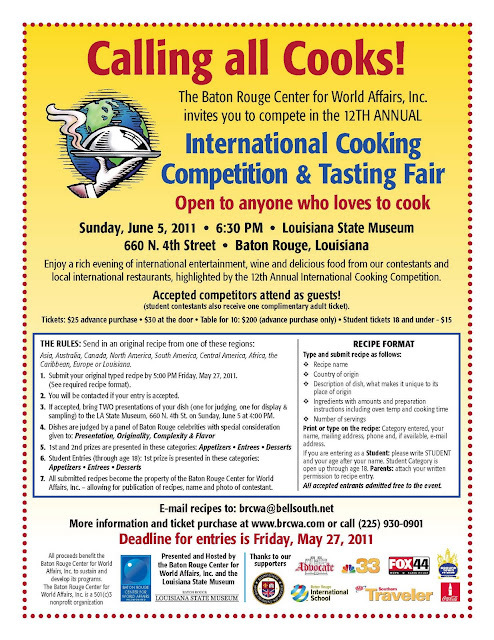 Baton Rouge Center for World Affairs Hosts an International Cooking Competition! 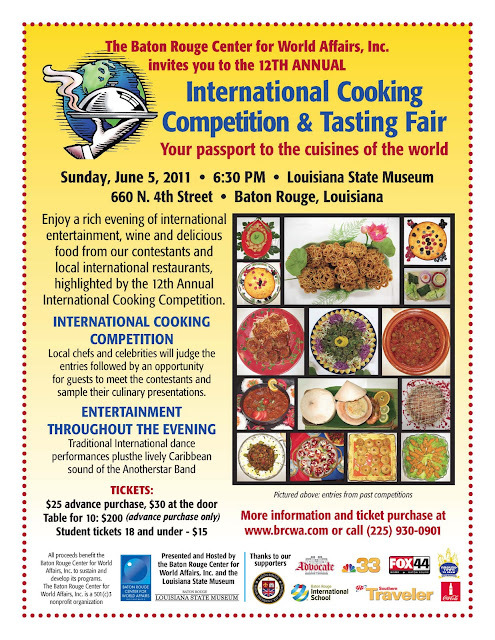 The Baton Rouge Center for World Affairs is having its 12th Annual International Cooking Competition (ICC) on June 5 from 6:30-9:00 pm at the Louisiana State Museum. It's a great, community event that combines the diverse culinary tastes of Baton Rouge residents into one night at the museum. All the contestants are local, amateur cooks who submit some amazing recipes... and they are looking for a few more amateur chefs to show off their skills! 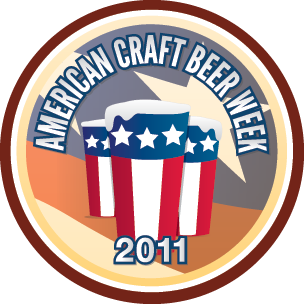 There will also be entertainment and food samplings from local restaurants/caterers for attendees to try. Below are several fliers for the event if you want to attend or enter as a chef! 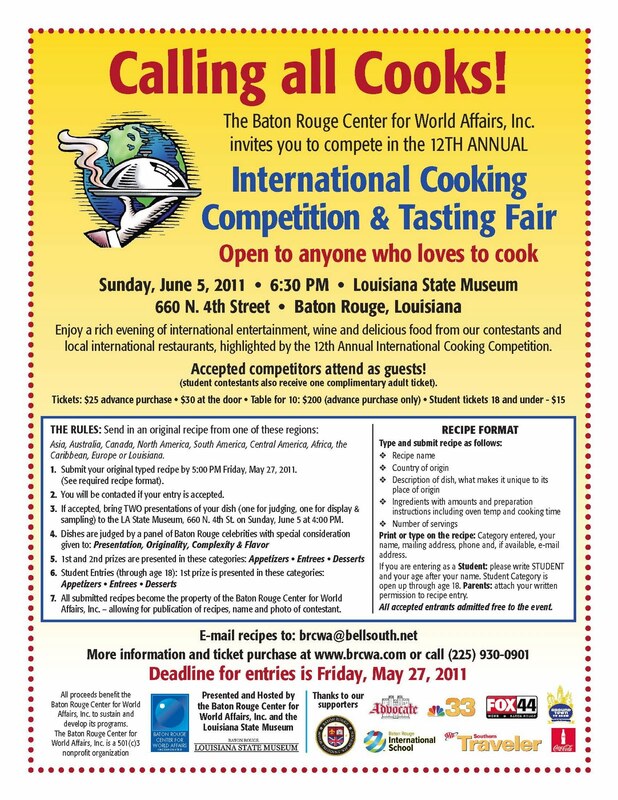 The ICC's focus is on a diverse array of cuisine (both from Louisiana and internationally), and they are in need of contestants, restaurants, and prizes for the winners. Don't be shy! Help support awesome events like this in Baton Rouge and contribute to our amazing culinary culture! Click on the fliers to enlarge! 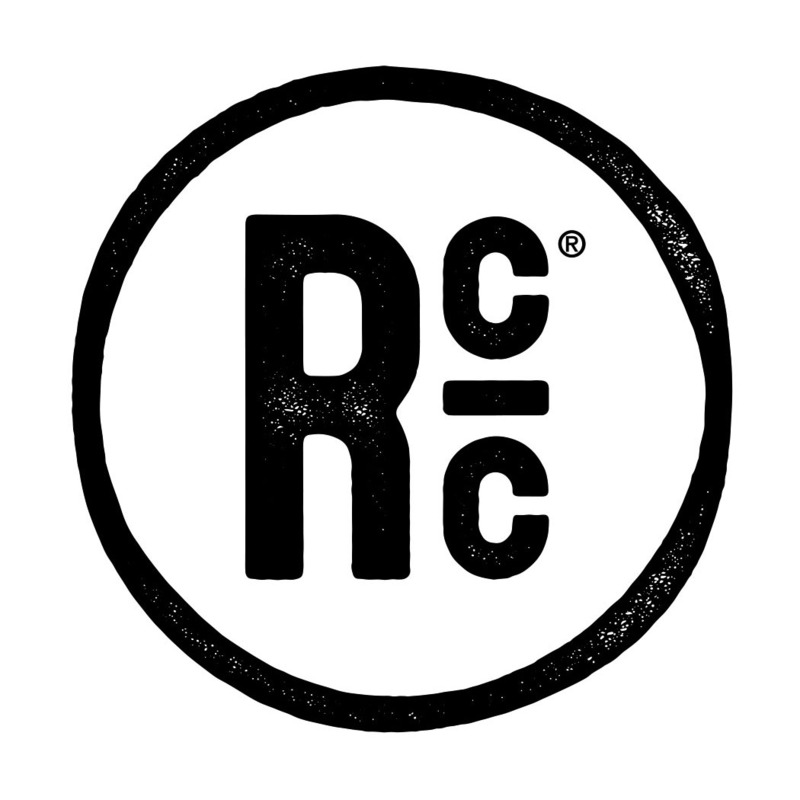 Click Here to Purchase Tickets or Email Your Recipe to BRCWA! 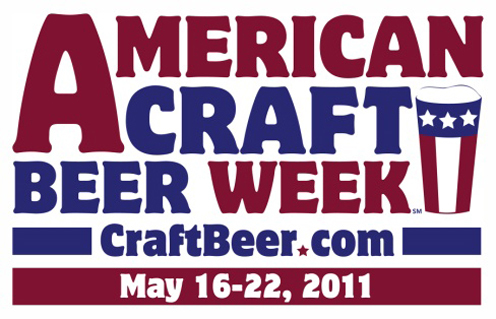 American Craft Beer Week comes to Louisiana! I'll also have Eric Ducote from the Baton Rouge Beer Scene! 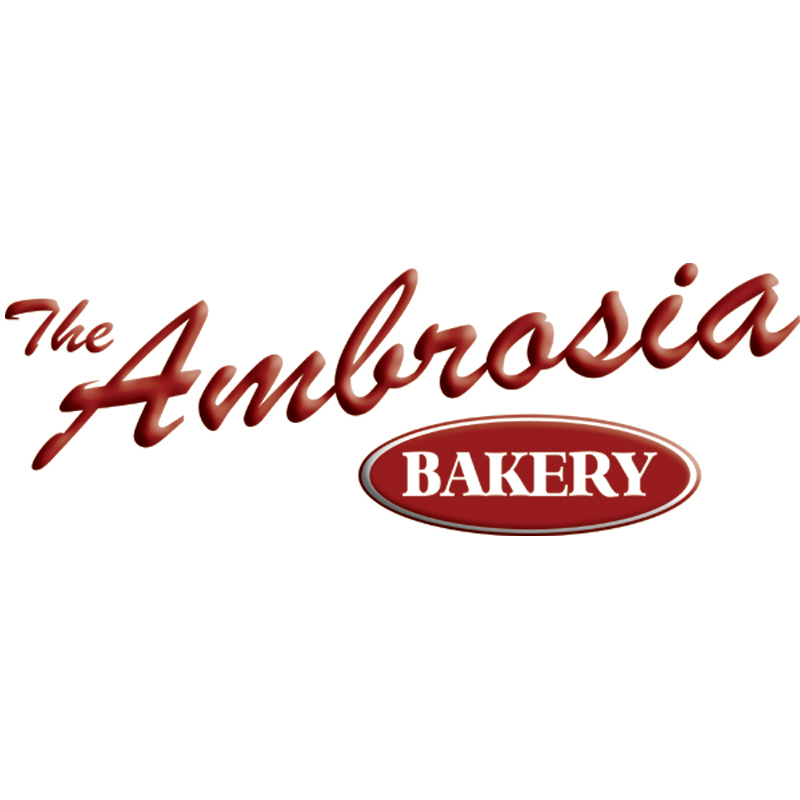 You can catch the Bite and Booze.com Radio Show presented by Calandro's Supermarket on UStream or on Talk1073.com. 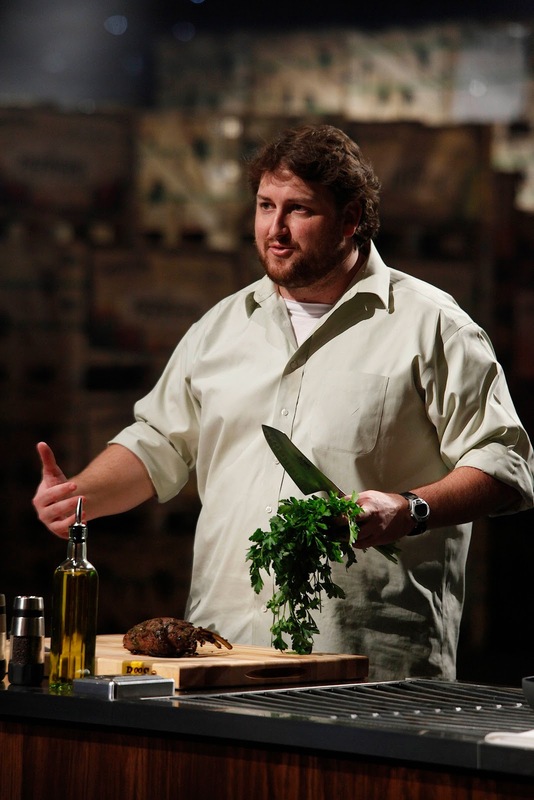 "Eat St." is Coming to Baton Rouge to Film for the Cooking Channel and Canada's Food Network! Eat St., the popular television program on America's Cooking Channel and Canada's Food Network, will be coming to Baton Rouge this week for three days of filming and production with some of our favorite trucks! The program travels around North America in search of the most inventive chefs in mobile kitchens. The street food trend has been booming in cities such as New York, Los Angeles, and Austin, and now it is Baton Rouge's turn to get recognized for our "Food Truck Revolution." This is a great opportunity for our city to showcase some of our local cuisine to an international audience! 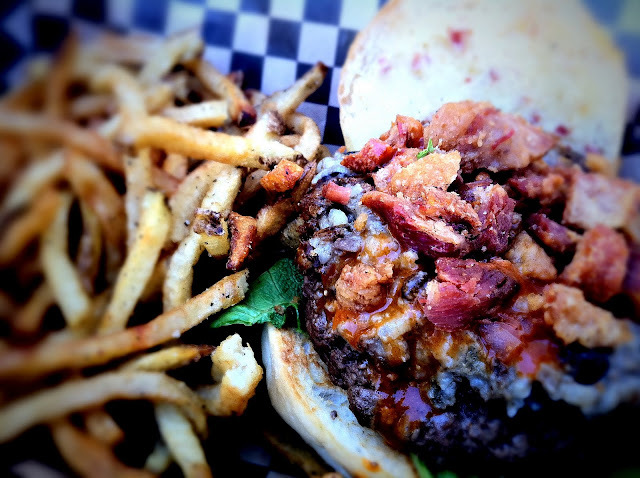 Curbside is Baton Rouge's burger truck. However, these aren't just any burgers and fries. Curbside grinds all their own meat, blanches their own "frites", uses local produce and fresh, locally baked buns. Their serving trays are made from recycled product and their cups are made from plants, not plastic. Oh, and get the pork belly preserves if you can! A couple weeks ago Curbside featured my homemade boudin on a burger and topped that with some fresh cracklins! The Bite and Boudin burger was a huge hit! Curbside will be stationed on Spanish Town Road in front of the State Capitol from 11-3 on Thursday, so go grab a burger and smile for the cameras! GOyaya's is a mobile crepe kitchen serving up fresh savory and sweet creations all around Baton Rouge. 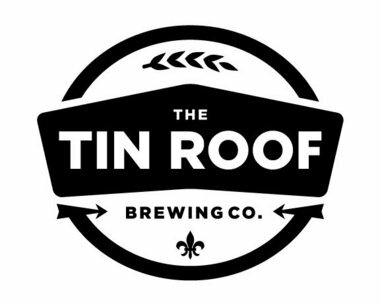 They are truly one of Baton Rouge's most unique mobile food vendors and their crepes are always impressive. Last week I had a "Chicken Mole" crepe and it blew me away. It featured shredded chicken in a Mexican mole sauce that took seven hours to make! The mole had some sweetness from blueberries, the richness from the Mexican chocolate, and a little nuttiness as well. Topped off with some sour cream and avocado, this is one crepe I'd go back from again and again! GOyaya's will be stationed downtown for lunch on Friday with the film crews. Track them down and get your 15 minutes... or seconds... of fame! 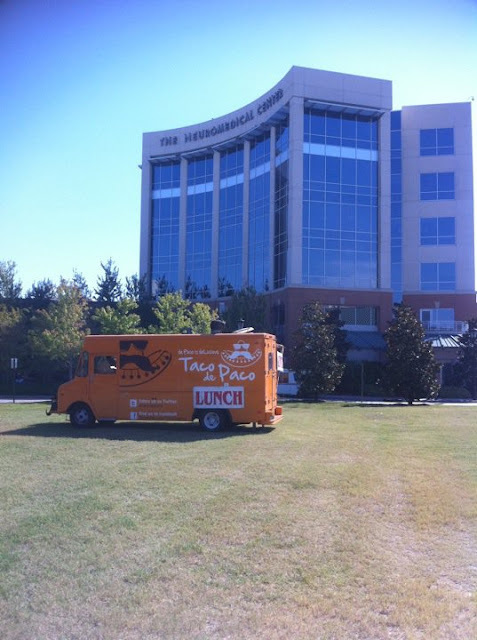 Taco de Paco roams around the streets of Baton Rouge slinging deLiciousness in tortilla sized packages. They have gotten more and more creative with their offerings and some of the tacos that they'll be serving on Saturday for lunch at the Neuromedical Center in Perkins Rowe look amazing. 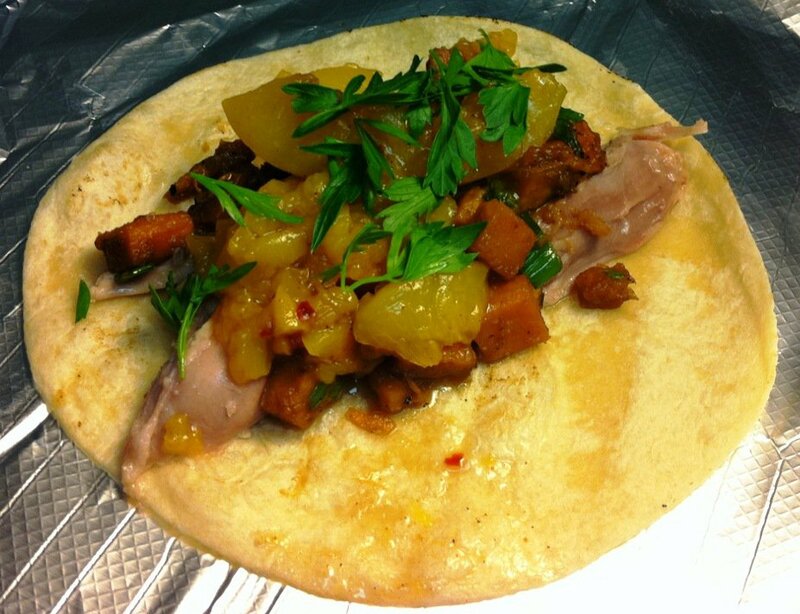 Last week they came up with The Emilio: Roasted Duck glazed with Louisiana Sugar Cane, topped with Sweet Potato Hash, and finished off with homemade Peach Preserves. deLightful! 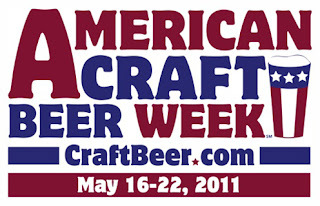 I'll be out there on Saturday after the Bite and Booze Radio Show presented by Calandro's Supermarket celebrates American Craft Beer Week from 10-11 AM. Come find me and feast for the Eat St. camera crews! MASTERCHEF Season 2 Premiers June 6th!! So why should you or I care? Well, today FOX announced the contestants from around the country that got invited to Los Angeles and cook for Chef Gordon Ramsay, Restaurateur Joe Bastianich, and Chef Graham Elliot. 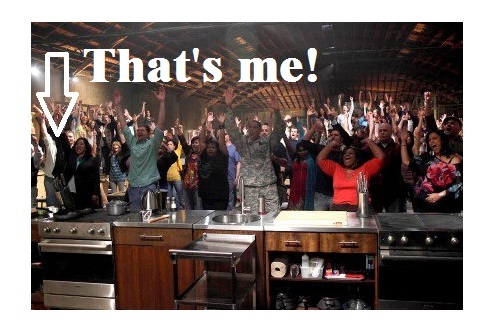 Out of over 20,000 that auditioned, I was one of the 100 hopeful amateur chefs!! You can find the complete list on FOX Flash. It might be a little difficult to tell, but that's me below! Tune-in to watch me on MASTERCHEF Monday, June 6 8/7c on FOX! Famed chef Gordon Ramsay is back for Round Two of his culinary smash hit and last summer’s highest-rated new series, MASTERCHEF, Monday, June 6 (8:00-9:00 PM ET/PT) on FOX. After conducting a nationwide search, 100 of the best amateur cooks in America, including a police officer, an oil rig engineer, an interior designer, a forklift operator, a professional poker player, a classical pianist and a tattoo shop owner, were flown to Los Angeles in the hopes of becoming the next MASTERCHEF and walking away with the life-changing grand prize. In the premiere episode, the hopefuls will prepare their signature dishes and present them to the renowned MASTERCHEF judging panel: Michelin-starred chef Gordon Ramsay; restaurateur and wine maker Joe Bastianich; and the youngest four-star chef in America, Graham Elliot. The judges are looking for presentation, flavor, originality and creativity, but most importantly – to have a chance – every contender must possess an immense passion for food. The amateur cooks will be put through the paces, and only the most deserving among them will win the coveted white apron and move on to the next round of the competition. One thing is certain in MASTERCHEF: Winning will be no piece of cake. On Tuesday, June 7 (8:00-9:00 PM ET/PT) and Monday, June 13 (8:00-9:00 PM ET/PT), the judges will continue to winnow down the Top 100 and ultimately reveal the Top 38. The competition heats up as more hopefuls are eliminated until the Top 18 are announced on Tuesday, June 14 (8:00-9:00 PM ET/PT). Swine Palace’s HEIST! 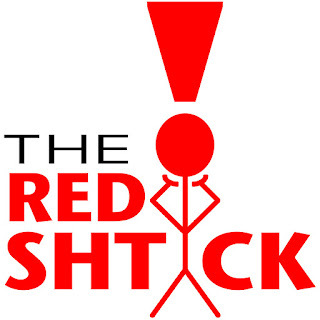 revolves around a fictional theft at the LSU Museum of Art. 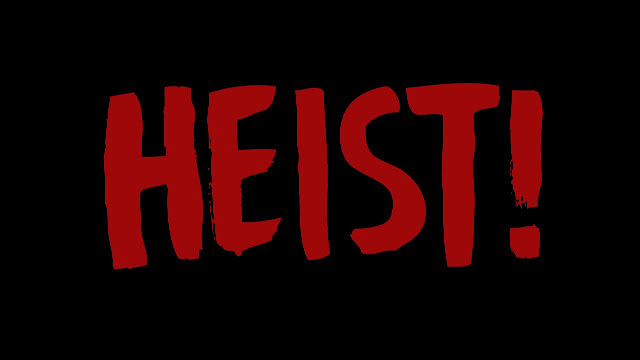 HEIST! is part delightful party, part live-action cartoon and part amusement park ride. It is a wild over-the-top theatrical caper happening in three dimensions in which the audience is an active participant in the show. Yes, I know... I'll be part of the show on Mother's Day. That's alright though! It is a great opportunity to grab your mom and take her to the theatre! It'll be a lot of fun!!! You can get more information and buy tickets on HEIST!’s Facebook info page.